Catholic theologians growing concerned about Biblical literacy. These articles reflect a fascinating and refreshing development within Catholicism. I have had countless discussion with my Catholic friends and colleagues about the role of Scripture in the lives of practising, good, faithful Catholics. They assured me there was a vital movement within the church to reemphasize the Bible in the daily lives of the church’s members. It seems they were in the know. 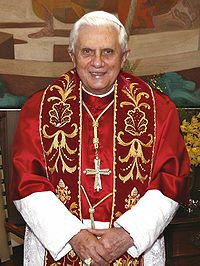 I have observed that Pope Benedict XVI, as a more conservative theologian with pragmatic bent, seems to nudge the faithful towards a more personal connection with the Scriptures. Biblical illiteracy is a bane to Catholic, Orthodox, and Protestant life. Long live the Scripture! on November 17, 2008 at 2:27 pm Comments Off on Catholic theologians growing concerned about Biblical literacy.